KUALA LUMPUR: Higher housing starts and building plan approvals last year signify confidence of developers and investors in the development activity, said National Property Information Centre (Napic) director Dr Zailan Mohd Isa. Some 400,000 transactions valued more than RM100 million were undertaken during the first three quarters of last year. Zailan said the second quarter of 2011 was the most active period during the period with more than 115,000 transactions recorded. Housing starts, a key economic indicator, refer to the number of residential building construction projects begun during a particular period. 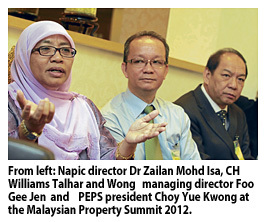 Speaking at the 5th Malaysian Property Summit 2012, Zailan said residential property sub-sector expanded significantly by 23.2 per cent after recording a 8.8 per cent growth for similar period in 2010. At a media briefing, summit chairman and real estate agency CH Williams Talhar and Wong (WTW) managing director Foo Gee Jen does not expect prices to soften within KL although the external uncertainties may have led property buyers to be more cautious. Choy Yue Kwong, who is president of the Association of Valuers, Property Managers, Estate Agents and Property Consultants in the Private Sector (PEPs) said past crises have shown that although property prices may drop in cities like Kuala Lumpur and Petaling Jaya for a short period, prices also pick up as fast. Zailan expects the vacant space in the retail and office sectors to be absorbed as more space taken up from the market as private investment spurred by the Economic Transformation Programme takes place. He described the outlook for the 2012 property market as bright with strong demand as developers and investors capitalise on the government's incentives. Demand for development land will also increase from the spillover effect of projects such as highways such as Ampang-Cheras-Pandan Elevated Highway, Guthrie-Daman-sara Expressway, Damansara-Petaling Jaya Highway, Pantai Barat-Banting-Taiping Highway, Sungai Dua-Juru Highway and Paroi-Senawang Highway. KUALA LUMPUR: Telekom Malaysia Bhd (TM) aims to sign service agreements with 20 property developers this year to deploy and provide its high-speed broadband service (HSBB) at their respective projects. 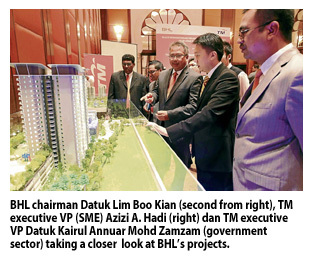 Its executive vice-president (SME), Azizi A. Hadi, said last year, TM inked agreements with 11 property developers, mainly for projects in the Klang Valley. "This year, we plan to expand our services in Penang, Sabah, Sarawak, Johor and obviously the Klang Valley region," he said after signing the agreement with BHL Group of Companies here yesterday. This move, Azizi said, will increase HSBB coverage to some 95 areas nationwide from the current 78. "To date, the premium HSBB is offered to 1.19 million premises and we expect to increase the figures to 1.3 million by year-end ," he said. Azizi said TM will launch Unifi in Ipoh and continue to expand it in key areas nationwide. The agreement with BHL was for the deployment and provision of HSBB network infrastructure and services to the latter's three projects. The projects are USJ One Park in Subang Jaya, KL Palace Court in Jalan Klang Lama and a development in Cheras. JOHOR BARU: UDA Holdings Bhd is looking for investors to undertake a joint-venture project to develop the Angsana II commercial complex. Chairman Datuk Nur Jazlan Mohamed said the complex, adjacent to its existing Plaza Angsana shopping complex in Jalan Tampoi, would cost between RM200mil and RM250mil. “We are open to any proposal from interested parties regardless of whether they are local or foreign investors,'' he said yesterday. The proposed Angsana II commercial project would be the first shopping complex in Johor Baru to incorporate a street-mall concept, Nur Jazlan told reporters after attending the corporate social responsibility programme at the home for the handicapped in Taman Sinar Harapan Tampoi, in conjunction with the company's 40th anniversary. He said the company would not limit itself to working only with a domestic partner or investor in the project and was more than willing to work with a foreign investor. 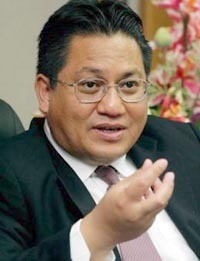 Nur Jazlan said that certain parties including politicians should not politicise the decision made by the company to cooperate with foreign partners in its property development projects. He said as a government-linked company (GLC), UDA's duty was to ensure that it was able to bring benefits to all Malaysians and not to a certain race only. “We need to start changing our mindset. The country will not be able to move forward if we continue to use race-centric issues in business activities,'' added Nur Jazlan. The company hoped to start Angsana II project this year if it was able to find a right partner for the project and “did not want to miss the boat again,” he said. Nur Jazlan was referring to the directive made by the Finance Ministry (MoF) to UDA to review its decision on a proposed joint-venture project with China's GLC Everbright International Construction Engineering Corp. He said a steering committee had already started reviewing the proposal made by the MoF to develop the former Pudu Jail site, better known as the Bukit Bintang City Centre. “The committee will see whether the MoF's proposal is viable compared with the model proposed by Everbright and it (the study) will probably take months,'' said Nur Jazlan. On an unrelated matter, he said UDA would spent RM15mil this year to renovate its 15-year-old Plaza Angsana shopping complex, including upgrading its faade and food court. IOI Corporation Bhd rose one sen or 0.19 per cent to RM5.34 as at 11.20am today as market players are bullish on its property business. IOI announced yesterday its 99.8 per cent-owned indirect subsidiary Multi Wealth (Singapore) Ltd has won a bid for a parcel of land in the island republic for S$408 million (RM995.5 million). Measuring about 24,417.6 sq metres (2.4ha), the land, in Jalan Lempeng, Clementi Avenue 6, is intended for condominium development. HwangDBS Vickers Research said it was neutral on the deal as the aggregate impact over five years would be less than 10 per cent of IOI's forecast pre-tax profits (approximately RM2.8 to RM3.4 billion per annum). "We believe the estimated S$709 million (approximately RM1,730 million) total investment cost is better spent on its higher-margin plantation operations," it said in a research note today. The research house maintains a "hold" rating on IOI. KUALA LUMPUR: IOI Corp Bhd has won a bid for a parcel of land in Singapore for S$408mil (RM995.5mil) that would enable the company to be involved in mass property market in the island-state. IOI Corp said its 99.8% indirect subsidiary Multi Wealth (S) Ltd had been notified by the Housing and Development Board of Singapore of its acceptance of Multi Wealth’s bid for the land measuring about 24,417.6 sq m at Jalan Lempeng. “The land, which is a rare condominium site, is located in the mature housing estate of Clementi and will have a good potential to tap into a large catchment of upgraders from the existing residents living in the area,” it told Bursa Malaysia. This win confirmed StarBiz report yesterday that IOI Corp would be a potential winner as it was the highest bidder. CIMB Research said the win was a slight surprise as it did not expect the group to venture into another Singapore property venture so soon after its recent purchase of the South Beach project. But CIMB Research is cautious on the Singapore property market, given the recent hike in stamp duties. SHANGHAI: China's property market slowed last year, official figures showed yesterday, as the government sought to bring down runaway housing prices amid fears of a speculative bubble. The country introduced a range of measures aimed at curbing the real estate market last year, such as bans on buying second homes in some cities, hiking minimum down-payments and introducing property taxes. Overall property investment rose an annual 27.9 per cent to 6.17 trillion yuan (RM3 trillion) in 2011, slowing from growth of 33.2 per cent in 2010, the National Bureau of Statistics said. Meanwhile, housing sales - excluding government subsidised homes - rose 12.1 per cent to 5.91 trillion yuan last year, marking a slowdown from 18.9 per cent growth in 2010. "Our major progress is that speculative-based investment in the property market has been curbed," statistics bureau chief Ma Jiantang told a news conference in Beijing. Analysts have warned the correction in the property market is threatening to drag on economic growth this year, despite government resolve to keep control measures firmly in place. Alistair Thornton of IHS Global Insight in Beijing said the rapid slowdown in property investment in the final month of last year indicated the overall economy was undergoing an "aggressive" slowdown. "In this light, the property market correction is providing the greatest downside momentum," he said. At the same time, China has pledged to invest more than $700 billion in low-cost housing to help those priced out of the market, with plans to build or renovate 36 million homes over the next five years. Property developers are hoping Beijing will ease control measures this year, though analysts are divided on the timing of such a move. In Shanghai, among China's most vibrant property markets, city mayor Han Zheng has dashed hopes of an immediate relaxation. "This year, the strength of the property market control measures will not be reduced and the policy will not change," he told a news conference on Monday. Home prices in most major Chinese cities dropped in November last year from the previous month with 49 of the 70 Chinese cities tracked by the government reporting falls. SYDNEY: Australian property trusts are likely to deliver a total return of 12 to 15 per cent this year, outperforming local equities and other Asia-Pacific property markets, analysts said. Australian REITs have proved resilient last year, slipping seven per cent against a decline of 14.5 per cent in the broader S&P/ASX 200 index. In comparison, Singapore's FT ST Real Estate Investment Trusts Index dropped 16 per cent, while Hong Kong's property sub-index has declined 24 per cent. Simon Garing, analyst at Bank of America Merrill Lynch, said Singapore property stocks faced a slowdown after the government rolled out measures to cool the residential market. "We expect Asian REITs will continue to underperform for the first half of the calender year," he said. "Australian REITs have been sort of a safe haven," he added. Morgan Stanley is also expecting Australian REITs to perform better than the broad market as investors look for defensive plays and focus more on income rather than capital gains.